Congratulations are in order for one of the finest infielders to ever play the game as Detroit Tigers legend, Alan Trammell, will take his place in the National Baseball Hall of Fame this summer. To honor this great shortstop's achievement we are pleased to unveil this unique commemorative Hall of Fame Bat. Each Commemorative Bat includes the reproduced work of noted artist Jolene Jessie, as well as the list of stats and achievements earned by Alan Trammell during his career as a Major League star. 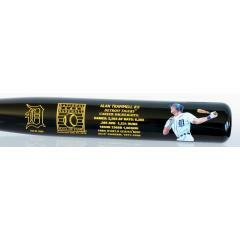 This full-size bat makes an amazing addition to any Tigers fan's collection, and will look great displayed on any wall in your home or office. Order yours today before they are sold out. This bat is officially licensed by MLB and the National Baseball Hall of Fame. Due to the limited nature of its release, we must charge your credit card for the full price of the bat immediately upon taking your order. This policy ensures we reserve a bat for you. We will confirm your order by email. This bat is not game used. Please allow 4 to 6 weeks for delivery.